Delegates at this year’s Annual Delegate Conference have sent a strong message to politicians of all colours that civil service impartiality must not be undermined. In his opening address, FDA General Secretary Dave Penman warned that an increasingly polarised political landscape has led to politicians on both the left and right “coalescing around an agenda that undermines the very fabric of an impartial civil service”. Penman said: “These ideological evangelists are believers and don’t welcome facts that don’t fit their narrative. They don’t welcome truth being spoken to power because they have an unshakeable belief in only one truth. “On the right we have seen the systematic and deliberate undermining of the civil service by those who are troubled by the challenging facts around our exit from the EU. They have sought to paint the civil service as a Remainer resistance movement, undermining the will of the people. There has been a constant drip feed of stories as fantastical as the targeting of leave donors for tax liabilities to the digging up of essays written by civil servants at university. He added: “On the left, the civil service is being painted as part of the establishment conspiracy by those around the Labour leader who openly suggest that, once in power, the civil service will seek to undermine the will of a socialist government. As ministers have become increasingly unwilling to defend their own officials, the FDA has become a lone voice standing up for civil servants in the face of these unfounded attacks and conspiracy theories. This was a fact acknowledged by guest speaker Melanie Dawes, Permanent Secretary for the Ministry of Housing, Communities and Local Government, who told delegates that she is “grateful for Dave’s courage in speaking out” on the behalf of civil servants. The FDA General Secretary reaffirmed the union’s commitment to defend both civil servants and the values they uphold, telling conference: “The values that the civil service will always be true to - impartiality, integrity and professionalism - are the values that helped create the FDA. 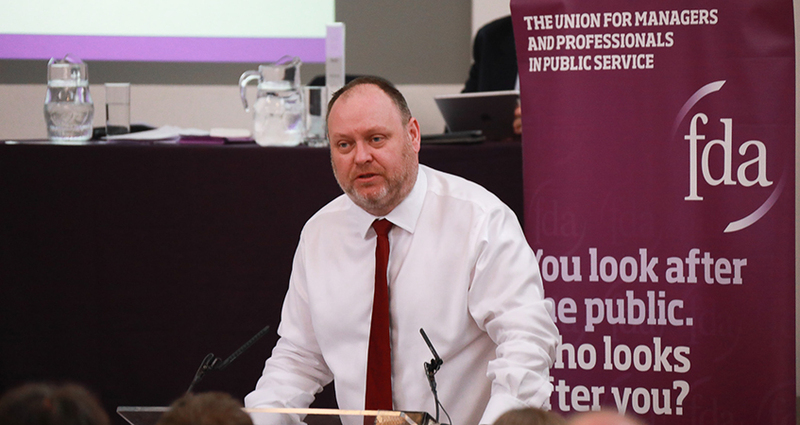 Delegates welcomed this commitment, unanimously passing a series of Motions to place civil service impartiality as a priority area of work for the union in the coming year. The ADC also called on Prime Minister Theresa May to publicly condemn the attacks on the impartiality and integrity of the civil service; commit to discipline members of the Government who conduct such attacks; and commit to swiftly counter any further attacks regardless of their origin.